Summary. The pictogram indicates that the humanity has very deep individuality presented on the Information level by a thick our borders of individual cells. It reveals in wars, hate, acts of terror, greed. However prolongation of our life in global cataclysms can be made only by the Transition on the safe level of the material world through the united consciousness. On the pictogram is represented the individual cell of human being with a wide thick internal border. On the other hand pictogram shows also the united cell of civilization. Pictogram points on carbon nature of humanity. The pictogram consists of combinations of several cubs, rhombs, pyramids with triangles and quadrangles in the basis. 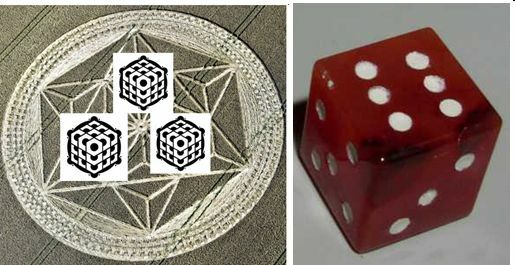 These are symbols of magnetic field danger, three previous levels of consciousness included in individual information cell of human being and etc. Let’s decode this pictogram according to ETC symbols of consciousness. 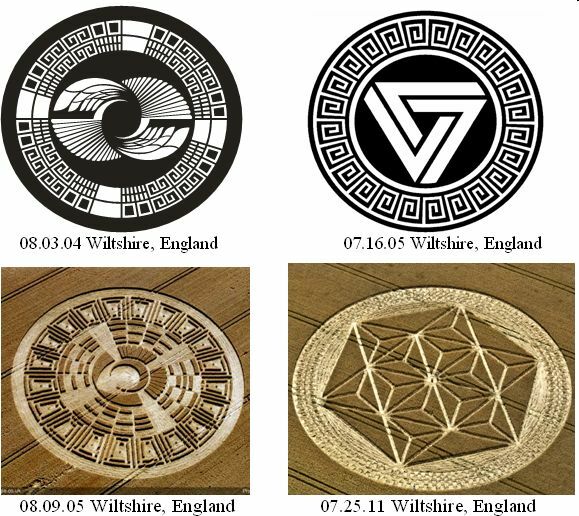 First of all, the crop circle shows an individual information cell of human being. It is indicated by a small circle in the center and a largest ring (Fig. 1). This is presentation of a human being in the Information world. Just as a human being, an individual cell contains a brain area, a body area and the outer boundary, which separates it. Human being has very thick outer border of individual cell, corresponding to the carbon nature of our life. The wide border is shown in many crop circles. Wide border of individual cell reveals in wars, acts of terror, indifference to fate of other people, greed, deep individuality. In the center of the pictogram is represented regular hexagon, which points on the carbon basis of our life on Earth. It is known that carbon has a hexagonal crystal lattice, which is based on a regular hexagon. 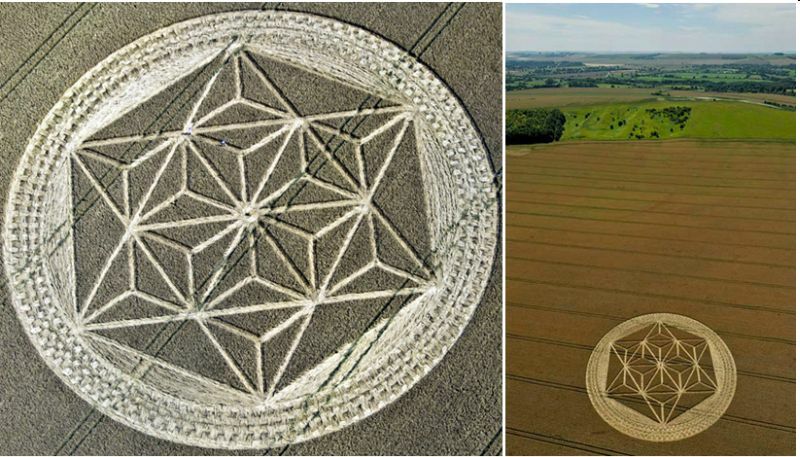 Thus, extraterrestrial civilizations present the information about carbon nature of our life by hexagonal shapes in crop circles and other pictograms. As it is known, carbon is very hard material, that’s why our cell has very wide border. Carl Sagan, famous American astronomer, honored to code the Arecibo message from Earth civilization told that all of us consists of stars. It is really so, however not only of stars, but also of minerals, plants and animals. ETC inform that consciousness of human being corresponds to the fourth level and includes three previous levels of consciousness – nonorganic and organic nature. This information is presented by three cubes uniting at the center in the small brain area of individual information cell. This information clearly represents a Trident, the digital code of ETC symbols of consciousness. The Trident is analogous to information cell of human being. The Trident is mostly used in the Nazca Lines. The first level of consciousness corresponds to inorganic nature of stars. Second level of consciousness – to the nonorganic nature of planets. Third level of consciousness – to organic nature – plants and animals. The fourth level of consciousness corresponds to human being. The fifth level of consciousness is the united consciousness of civilization. It is the highest level of consciousness in the universe. Taking into account the carbon basis of human’ life the pictogram can be presented also by three cubes consisting of hexagons. 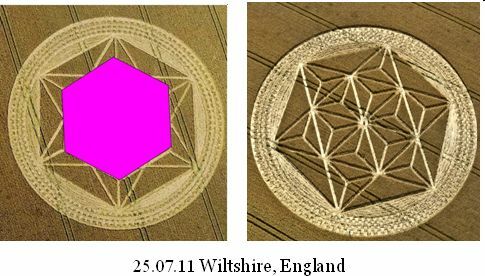 So, three previous level of consciousness included in individual information cell of human being have carbon base, presented by hexagon, featured by six sides. So, carbon bases with the major number 6 represents the nature of each of three previous levels of consciousness with number 3. Thus, we get number 666 the Number of the Beast. Mysterious number 666, the Number of the Beast, associated with devil reveals blind fury of stars and also ferocity and deep individuality of animals corresponding to the three previous level of consciousness – nonorganic and organic nature included in information cell of each of us. As a result a wide border of individual human’ cell also reveals in mysterious number 666. So, number 666 reveals three previous levels of consciousness included in individual cell of human being, each of which having the carbon basis. ETC inform that for our Transition we need to form united cell of civilization. So, all individual cells have to joint together and all borders have to be dissolved to form one common united cell of Earth civilization for the Transition. But carbon, basis of our life, as very hard material will not allow dissolving borders. That’s why civilization’ united cell can be formed only through laser beam, which will burn the hard carbon borders and therefore remove our bodies from the level of Crystal structure. Simultaneously we will resurrect on the Highest level of the material world. On this new safe level without global cataclysms we will prolong our life. This is the only way to be saved from global cataclysms which will begin on Earth very soon. Rhombs are symbols of magnetic field danger and together with 3D pyramids and other figures point on critical situation on Earth. 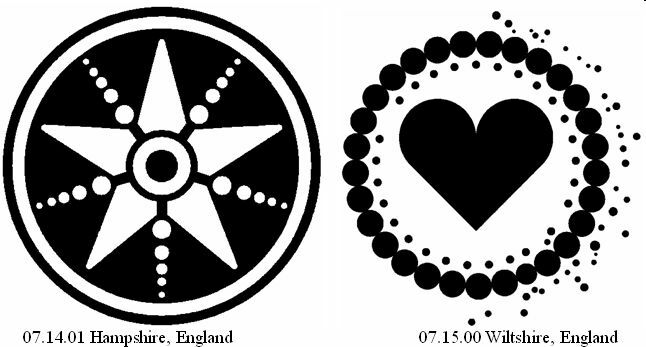 So the pictogram call for transfer from individual consciousness to the united. We decoded hundreds of ETC messages and presented in our Press Release important information for humanity about beginning of global cataclysms and three preliminary cataclysms before them. Comments. The pictogram shows that a human being has very thick outer border of individual cell, corresponding to the carbon nature of our life. Consciousness of a human being corresponds to the fourth level. The pictogram informs that three previous levels of consciousness, included in individual information cell of human being have a great influence on our life. 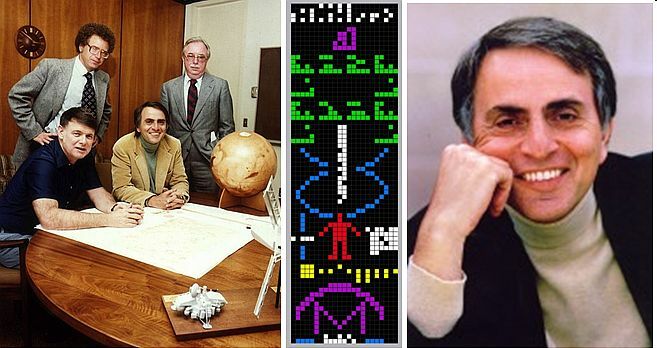 That’s why Carl Sagan, famous American astronomer, honored to code the Arecibo message from Earth civilization told that all of us consist of stars. According to ETC information we consist not only of stars, but also of minerals, plants and animals. This information is presented by three cubes uniting at the center in the small brain area of individual information cell. 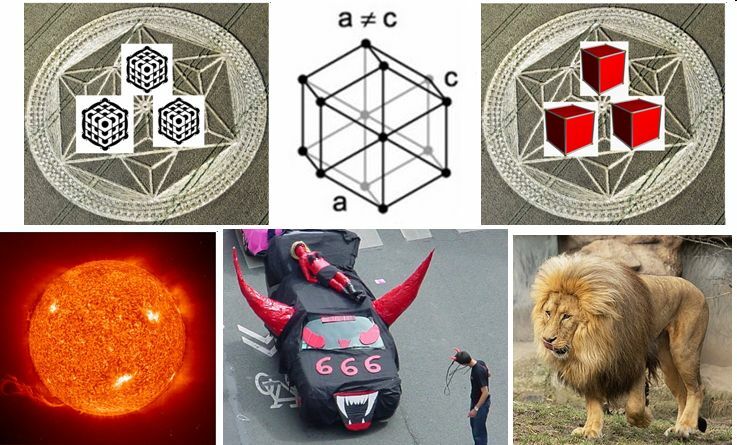 Three previous level of consciousness included in individual information cell of human being have carbon base, presented by hexagon, featured by six sides. So, carbon bases with the major number 6 is the nature of each of three previous level of consciousness with number 3. Thus, we get the number 666, the number of the Beast. Mysterious number 666, the Number of the Beast reveals deep individuality of nonorganic and organic nature corresponding to three previous level of consciousness included in information cell of each of us and as a result a wide border of individual human’ cell. So, very thick border of individual information cell of human being has very hard possibility to form united consciousness necessary for the Transition on the Highest level of the material world for prolongation of life in global cataclysms beginning. But carbon, basis of our life, as very hard material will not allow dissolving borders. That’s why civilization’ united cell can be formed only through laser beam, which will burn the hard carbon borders and therefore remove our bodies from the level of Crystal structure. Simultaneously we will resurrect on the Highest level of the material world. On this new safe level without global cataclysms we will prolong our life. This is the only way to be saved from global cataclysms which will begin on Earth very soon. Rhombs are symbols of magnetic field danger and together with 3D pyramids and other figures point on critical situation on Earth. So the pictogram calls for transfer from individual consciousness to the united.